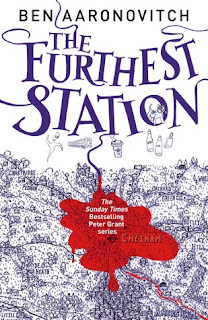 The Furthest Station is a novella in David Aaronovitch’s “Peter Grant” series, centred around a young policeman who has to investigate supernatural crimes whilst getting a handle on his own magic. In this instance, that means investigating the appearance of ghosts on the Tube. Aaronovitch has always had a good eye for environments, and the London he constructs is at once familiar and accented with the deeply strange. The Tube is its usual bustling space, filled with throngs of humanity, happy to overlook a line of police tape on a platform if they can get on with their commutes. There’s some lovely asides as well – such as a visit to a train depot, where the Tube trains are stored overnight. It feels dark, claustrophobic, and safety conscious – and real enough to serve as an insight into how the Tube system works. There’s more here of course; worn suburban towns on the limits of the London network, their bucolic entropy a sharp contrast to the energy and enthusiasm coming from the nearby metropolis. But they’re familiar as well – larger houses, more space, torn between being something smaller or a “commuter barn”. The casual asides which help identify these places – the lack of a coffee shop in the train station, for example – are both wryly humourous and devastatingly accurate. This is all well and good, and it’s always enjoyable following Aaronovitch’s fluid prose as he exposes some interesting areas of London, but it helps that he can sell the supernatural as well. Sitting in the interstices of our reality are the strange, the troubled, and the dangerous. Previous books have given us magic-users who happen to be policemen, tasked to defend the populae and ensure the peace with little in the way of manpower or funding. They’re still there, and the fusion of the mystical with the humdrum-yet-compelling reality of modern policework is as delightful as ever. This time though, we’re exploring ghosts – what they are, how they work, and potentially, whether they can commit crimes. The supernatureal elements here felt natural, if that makes sense – they had their place in the narrative, and it seemed eminently sensible that a ghost might ride a Tube train, or that a dog might be able to track the echoes of magic that they give off. In any event, Aaronovitch has done well here. This is a corner of London it now feels as if I’ve explored, despite never having ventured down the tracks of the Tube after dark, and his ghosts and monsters are vividly convincing. Most of the focus here is on Peter Grant; he’s a policeman who happens to be a wizard, part of a large family originally from Sierra Leone, and his relationship with a river goddess can probably be described as ‘complicated’. Peter is pleasantly cynical, his wry, sharp observations on the small futilities and triumphs of life in the Metropolitan Police helping make the whole thing more convincing. He’s intelligent and incisive, but has an aura of the everyman, even this far into the series – and that helps draw the reader in, and get us to feel Peter’s struggles as our own. In this instance, he’s joined by his boss, DCI Nightingale, a man who bored a hole through several inches of Tiger tank with a magical projectile. Nightingale is suave, old fashioned, and implacable. His mentoring of Peter is always enjoyable, the gentle student-teacher relationship surrounded by quips about Peter’s terrible Latin, and the occasional fireball. I’m always happy to see Nightingale get some time on the page, and he’s still an absolutely fascinating character. Peter’s teenage relative, Abigail, gets some time here too. She’s clearly intelligent, with a penchant for long-suffering looks when dealing with Peter’s apparent obtuseness. Their relationship almost mirrors Peter’s with Nightingale, though there’s some wonderfully entertaining banter injected as well. If Peter and Nithingale worry about letting Abigail into the magical world, she’s…well, she’s probably already there, critiquing old traditions, and trying not to get into too much trouble (or at least, trying not to end up having someone else bail her out). Abigail has turned up before now in minor scenes, but she grows on the page in this novella; there’s clearly hidden depths there, and it’s great to see her efforts, having decided what she wants to be a magic user, to grap her goal as quickly as possible. Where Peter is wiser, and occasionally more cautious, she’s likely to grasp the flaming, gravity defying nettle – which may or may not be a bad thing. The plot – well, our protagonists spend a fair bit of time trying to work out why ghosts are appearing on the tube, and looking into possibly connected mundane crimes. The blend of the familiar and the bizarre works really well here; the central mystery is dark, worrying and intriguing – and would probably be so without the icing of magic. There’s some nice twists and turns here, and the investigation is tense and tightly written. It’s a cracking mystery, one that let me brood over it for a while before an intriguing, if troubling, conclusion. If you’re coming to this after catching up on Peter Grant novels, it’s more of what you’ve probably enjoyed up to now – magic, mystery and mayhem, with a side order of cynicism, social observation and pitch-perfect British charm. If you’ve never read one of the Peter Grant series before, this is a decent entry point, and gets across the central themes of the world very well – though I’d still advise you start back at the beginning. Either way, I had a lot of fun reading this; it’s thoroughly enjoyable, and thoroughly recommended.